Pinecrest Lake is very Secluded and Nestled in the Heart of the Pennsylvania Pocono Mountains. This Wonderful Community offers you the Premiere Vacation and Full Time Living Accommodations in a Private Estate Setting. 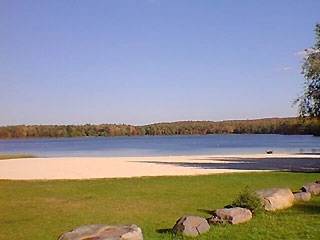 Pinecrest Lake is located in the tiny town of Pocono Pines PA only minutes from Lake Naomi Club. It has been developed by Oriented Professionals that bring to it's home owners a Quality Vacation Home and a Supreme Vacation Experience! It is one of the many Amenity Filled Communities that make it not only Perfect in it's Privacy and Location, but also full of Fun Filled Activities Perfect for Golfers, Swimming, and Family Fun! Amenities in this Lovely Community include an 18 Hole Golf Course with a Clubhouse, a Breathtaking 77 Acre Lake with a Beach used for everything including Boating! Also, there are Har - Tru Tennis Courts with a Proshop, Miles of Cross Country Jogging Trails and, an outdoor Swimming Pool with Slide and Diving Boards on site. Pinecrest Lake also has Amenities for your Winter Time Experience in the Poconos! Enjoy on - site Winter Activities including Snowmobiling, Skiing, and Ice Skating! Pinecrest appreciates the outdoors as well with it's own Nature Reserve for Local Wildlife to dwell Safely and Undisturbed. Pinecrest keeps it's Residents safe with a 24 Hour Roaming Security System! Want to see more? Click Here to see more on Pinecrest Lake and homes avilable in this community. Or, to browse through a number of listings in the Pocono Mountains FOR FREE! Take a free MLS Search as well!